benzyrnill, 旎宫嘉坊: a raining day, busy with microblogs' impression improvement. a raining day, busy with microblogs' impression improvement. it has been more than a week since i update my album here. i recently surfed lately in night, so gotup later than usual. these days frequent cloudy days, so i can work in open air in my dad's house' front yard for more than 7 hours or so. there r also raining days. last sunset when i sang a love song, it drizzled, from a sunny day. this morning before i gotup it rained and continued since them. i worked in my bedroom under lamp most of the day, busy with fine tuned the background picture of my family twitter accounts, and i think its rewarding. i got break till after 3pm and satisfied. after rested some time i decided to blog it, and update my album with shots, mostly still life in the rain. those days i also spent lots of time got myself familiar with the expanding service of qq, a domestic mainstream service provider. i also fine tuned my microblog with 3 domestic sp, ie. qq's taotao, jiwai.de, fanfou.com, founding can update all of them via qq's signature. i also setup my cellphone, so as to post on the move, and autopost to other microblog portal, including my twitter. i do anything under God's guide. still, i got revenge from my nephew, who i love best among the next generation of my old family. 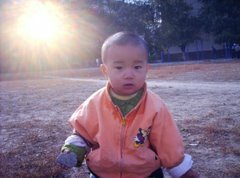 i started to comment on his blog at qzone, a service of qq, when he complained pains of losing a love, then he silenced, till recently he practicing in remote province before his graduation. this time he despised love and friendship. i commented that they do exist and should be cherished. i told him he in God's fond. that ignite his revenge. he didn't deleted all posting, but changed his homepage with picture of sword and titled it "killing". i never forget anything i did, but i surely see the gaps between the faith and the person self-contented in material world. ok, its a peaceful night, and the rain likely stopped. i thank u, Masheng, let me the baptism and time to linger indoor and watch the rain. its really too beautiful. raining afternoon, front yard of my past dad's old house.